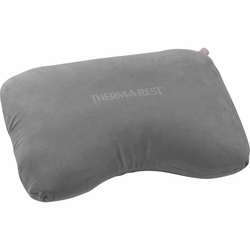 Therm-a-Rest Air Head Pillow. Designed with the perfect amount of lift and loft and just the right combination of firm and soft, the new Air Head™ Pillow will help you drift off—just about anywhere! Combining air and open cell foam technology, this innovative pillow is made with an inflatable, baffled core, providing a stable, highly compressible foundation. Then, to top it off, we add a luxuriously soft layer of open cell foam and cover the entire pillow in brushed polyester—all to make drifting off into dreamland a reality.